METHODS: Data based on the South African national population-based survey in 2012 for 26 453 individuals (52.0% women and 48.0% men) aged 15 years and older were analysed. Past 3-month drug use was assessed with the 'Alcohol, Smoking and Substance use Involvement Screening Test (ASSIST)'. Bivariate and multivariable logistic regression was conducted to assess the association between sociodemographic factors, health variables and any past 3-month drug use. RESULTS: Overall, any past 3-month drug use was 4.4%, 7.9% among men and 1.3% among women. The proportion of past 3-month cannabis use was 4.0%, followed by sedatives or sleeping pills 0.4%, amphetamine-type stimulants 0.3%, cocaine 0.3%, opiates 0.3%, inhalants 0.2% and hallucinogens 0.1%. Among the nine South African provinces, any past 3-month drug use was the highest in the Western Cape (7.1%), followed by the Free State (6.3%) and Northern Cape (5.2%). In adjusted, multivariable, logistic regression analysis among both men and women, younger age, being mixed race and hazardous or harmful alcohol use were associated with any past 3-month drug use. In addition, having been a victim of violent crime and sexual risk behaviour among men and having psychological distress among women were associated with any past 3-month drug use. CONCLUSION: An increase of any past 3-month drug use from 3.7% in 2008 to 4.4% in 2012 was observed in South Africa. Prevention and intervention activities targeting drug use, in particular in identified risk groups, need to be strengthened in South Africa. Previous investigations in South Africa and other countries found that specific sociodemographic factors were associated with drug use, including male gender,5,6 younger age,5 specific population groups (mixed race and white people),5,6 lower income or not employed5 and geolocality such as urban areas.5,7 Further, certain health risk behaviours such as common mental disorders (major depression and anxiety disorders),8,9 alcohol use disorders,10 HIV risk behaviours11 and criminal victimisation12 have been found to be associated with drug use. In order to update planning on drug use programming, more recent national population-based prevalence data on illicit drug use among adolescents and adults in South Africa are needed. Therefore, the purpose of this secondary analysis was to make more recent estimates on the frequency and type of drug use among women and men 15 years and older available using a nationally representative household survey in 2012. Drug use in the past 3 months was assessed with 10 items of the 'Alcohol, Smoking and Substance Involvement Screening Test (ASSIST)', e.g. 'In the past 3 months, how often have you used cannabis (dagga, marijuana, pot, grass, hash, etc.)? '14 This included the item 'Besides drugs prescribed by a health professional, have you ever used a drug by injection?' The response option was 'never', 'Yes. In the past 3 months' and 'Yes, but not in the past 3 months'. One item was added 'Whoonga (mixture of heroin, dagga = cannabis and antiretrovirals)'.13 Response options ranged from 1 = never to 5 = almost daily. Any drug use in the past 3 months was coded as 1 and never as 0. All items were added together to indicate the prevalence of any illicit drug use in the past 3 months. Cronbach's alpha for this section of the ASSIST in this sample was 0.61. Demographic measures included age, educational level, race (African black people or other races), geolocality, province and employment status. Psychological distress was measured with the 'Kessler Psychological Distress Scale (K-10)'.15 The 10-item scale assesses global psychological distress experienced in the past 30 days, e.g. 'In the past 30 days, how often did you feel so restless that you could not sit still?' Response options ranged from 1 = 'none of the time' to 5 = 'all the time'. These scores were added up, with higher total scores indicating higher psychological distress.15 A cut-off of 16 scores and more for detecting depression and anxiety disorders was used, as suggested in a previous validation study of the K-10 in the general population in South Africa.16 Cronbach's alpha for the K-10 in this sample was 0.89. Hazardous or harmful alcohol use was assessed with the 10-item 'Alcohol Disorder Identification Test (AUDIT)', e.g. 'How often did you have a drink containing alcohol in the past 12 months? '17 Response options ranged from 0 to 4, with a summed total range from 0 to 40 scores; a score of 8 or more indicated hazardous or harmful or probable dependent drinking.17 Cronbach's alpha for the AUDIT in this sample was 0.84. Descriptive statistics were used to summarise drug use prevalence, sociodemographic factors and health variables. 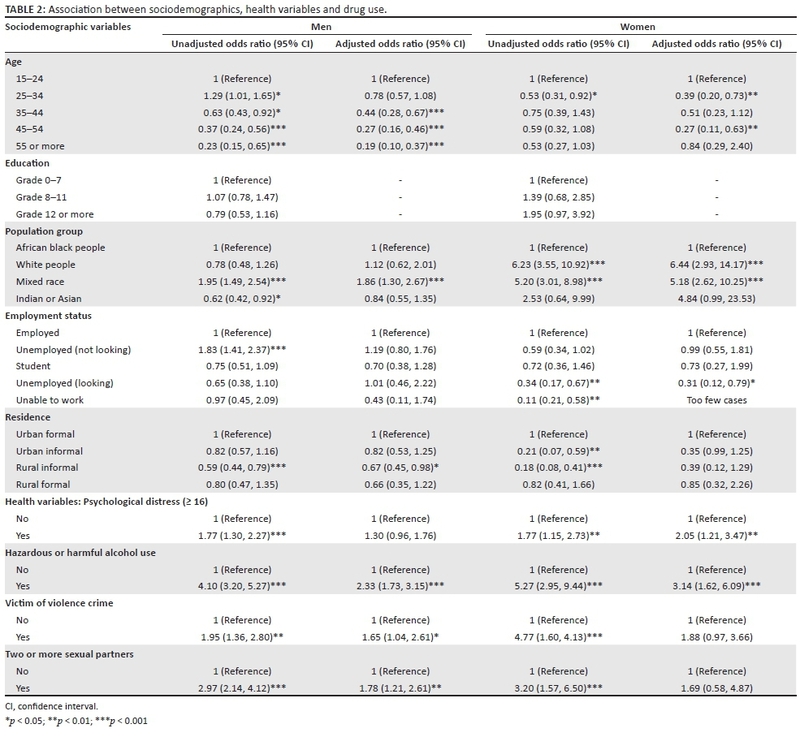 Associations between the outcome variable of any past 3-month drug use (cannabis, cocaine, amphetamine, inhalants, sedatives, hallucinogens or opiates including Whoonga), sociodemographic and health risk-independent variables were examined by calculating odds ratios. Unconditional multivariable logistic regression was utilised to assess the impact of explanatory variables for the outcome of past 3-month drug use prevalence, for women and men separately. All variables that were statistically significant at the p < 0.05 levels in bivariate analyses were included in the multivariable models. In the article, weighted percentages are presented. The 'svy' command was utilised to take into account the multistage cluster design of the survey. All statistical analyses were performed by using Stata software version 12 (Stata Corp., College Station, TX, USA). This analysis is based on data on individuals aged 15 years and older who participated in the survey. The study survey proposal was approved by the 'HSRC Research Ethics Committee (REC: 5/17/11/10)' and by the 'Centers for Disease Control and Prevention' (CDC). Response rates for the interview was 89.5%.13 The total sample included 26 453 persons aged 15 years and older, 52.0% women and 48.0% men. More than half of the participants (52.0%) were between 15 and 34 years old, 40.2% had Grade 12 or more education, 77.8% were from the African black population group, 39.3% were formally or informally employed and 51.9% lived in urban formal areas. A large proportion of the participants (37.8%) reported psychological distress, 11.1% hazardous or harmful or probable dependent alcohol use, 14.7% had become victim of a violent crime in the past 12 months and 19.1% had more than one sexual partner in the past 12 months. Overall, the past 3-month of any drug use was 4.4%, 7.9% among men and 1.3% among women. The proportion of the past 3-month cannabis use was 4.0%, followed by 'sedatives or sleeping pills (Valium, Mandrax, Serepax, Rohypnol, etc.)' 0.4%, amphetamine-type stimulants (speed, ecstasy, tik, etc.) 0.3%, 'cocaine (coke, rocks, crack, etc.)' 0.3%, 'opiates (heroin, morphine, methadone, codeine, Whoonga [mixture of heroin, cannabis and alleged antiretrovirals], etc.)' 0.3%, 'inhalants (nitrates, glue, petrol, paint, thinners, etc.)' 0.2%, and 'hallucinogens (lysergic acid diethylamide [LSD], acid, mushrooms, Phencyclidine [PCP], Special K, etc.)' 0.1%. The prevalence of past 3-month drug by injection was 0.6%, and the use of Whoonga 0.2%. Among the nine South African provinces, any past 3-month drug use was the highest in the Western Cape (7.1%), followed by the Free State (6.3%), Northern Cape (5.2%) and Gauteng (4.9%) (see Table 1). In adjusted, multivariable, logistic regression analysis among men, younger age, being mixed race, not living in a rural informal area, hazardous or harmful alcohol use, having been victim of a violent crime and having two or more sexual partners in the past 12 months were associated with any past 3-month drug use. 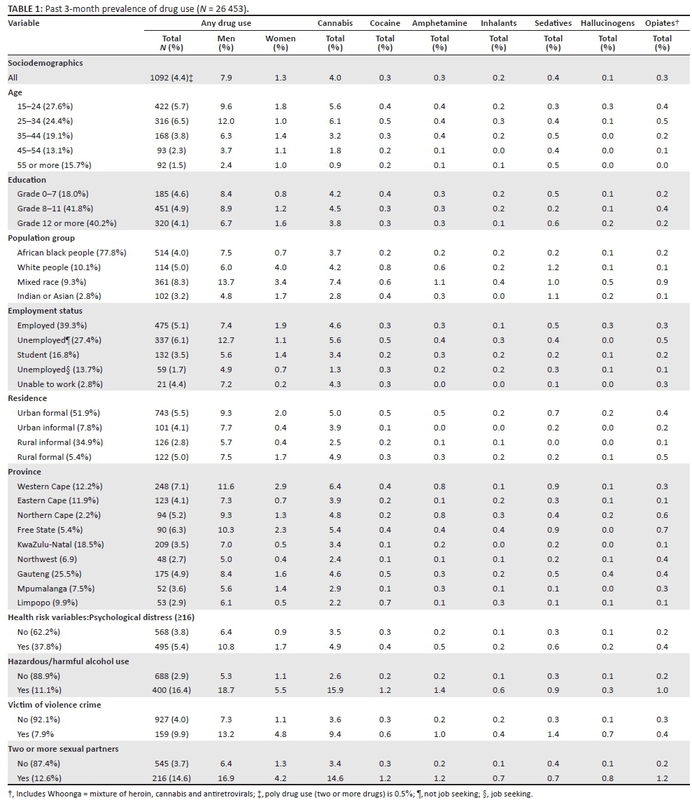 In adjusted, multivariable, logistic regression analysis among women, younger age, being white people or of mixed race, not unemployed (looking for job), psychological distress and hazardous or harmful alcohol use were associated with any past 3-month drug use (see Table 2). In agreement with previous reviews,8,9,10,11,12 this study found that hazardous or harmful or probable dependent alcohol use among both men and women, having had more than one sexual partner in the past 12 months among men, having been victim of violent crime among men and psychological distress (anxiety and depression) among women were associated with drug use. Drug use prevention and intervention have to include co-morbidity factors such as common mental disorders, alcohol use disorders and sexual risk behaviour. This study was cross-sectional and no causative conclusions between independent variables and drug use can be drawn. The data on drug use were collected by self-report and may underreport the true consumption rate.23 Furthermore, the internal consistency of the ASSIST questionnaire for the drug use section was only moderate (0.61). Possible reasons for this may be that alcohol and tobacco use were not assessed as part of the ASSIST and an additional item (Whoonga use) had been added. Further, the ASSIST assesses methadone as an opioid, while technically it is a synthetic opioid. An increase of any illicit drug use prevalence rates was observed from 2008 to 2012 in South Africa. Prevention and intervention activities targeting illicit drug use, in particular in identified risk groups, need to be strengthened in South Africa. The work used data from the Human Sciences Research Council. South African National HIV Prevalence, HIV Incidence, Behaviour and Communication Survey (SABSSM) 2012: Combined - All provinces [Data set]. SABSSM 2012 Combined. Version 1.0. Pretoria South Africa: Human Sciences Research Council [producer] 2013, Human Sciences Research Council [distributor] 2016. https://doi.org/doi:10.14749/1485430466. The original study was supported by the 'USA's Centers for Disease Control and Prevention and the Human Sciences Research Council, the Bill & Melinda Gates Foundation, the United Nations Children's Fund and the South African National AIDS Council'. K.P. and N.P.M. designed the study. K.P. analysed the data and wrote the draft article. All authors read and approved the final article.